Despite all the promises and assurances that the border crossing out of Russia would be as slick and as impressive as the process of going in, it all came to naught today as all the hopes and planning came unravelled. It’s hard to think of a worse border crossing – there are tiny African countries who can organise immigration and customs desks more efficiently than this. All of us are in Tallin, we are in a very comfortable hotel, and the afternoon for those of us who got through in time, has been some of the finest and most enjoyable roads of the entire trip. Smooth, sandy-gravel forest tracks, free flowing open bends, now we understand why Estonia is a country which has rally enthusiasts raving. Even the coast road was a joy to drive – its like a step back in time, wooden chalets and log cabins, twisty smooth tarmac, not a pothole or ripple in sight, smiling faces, cheering children, Estonia has it all. Its just that getting here from Russia can be such a pain. Hugo Upton claims the record, he spent 11 hours crossing from Russia to Estonia. It’s an enormous test of patience. You sit in the lane you think is moving, then discover it’s the wrong one. Locals and trucks barge in front, for newcomers, and foreigners without the language, it’s a highly frustrating game of lottery to get a passport stamped, the bit of paper that they gave you when you came in returned, our colour-photocopies of the log-book examined, someone lifts the bonnet and the boot-lid to ensure we are not carrying out a pet dog (the examination is that cursory), and you think a system could be devised that does all this in minutes… five minutes a car would suffice. We allowed no less than four hours per car – enough slack there to ensure we all “joined up” with a programme of Time Controls. It could have been a super day. For some, it was…once into Estonia. We had two Time Trial sections planned, each running over wonderful forest tracks, specially closed for us and monitored by experienced local motor-club officials. It could have ran like clock-work. We have a small army of British marshals who have trekked out to make it all work, and provide us with very many more checkpoints…results have yet to be computed as this is written, but, its clear the organisation is now on the horns of a dilemma. Some ran what was planned, and every Time Control was in place, every marshal delivered the goods. 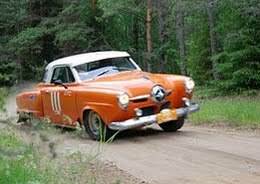 The timing of the test-sections was smoothly clicking into gear as soon as the first car arrived. Tom Hayes with Andy Vann at the wheel (picture left) was swinging through the bends and looked dramatic with giant sweeps of crossed-up opposite-lock driving.... the Germans in the very British Alvis were spectacular, but had electrical problems, the Bentleys loved the smooth surface and long open bends, it was something for everyone. Even the Singer was revelling in it all. 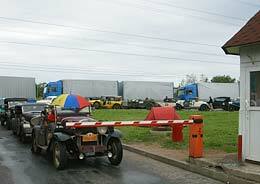 Except about 40 or so cars were stuck in the queues at the border – helpless. A further hindrance, at least 20 cars were pulled in by Russian police, some more than once, and several crews taken to road-side police-offices, for large demands of money. David Williams was threatened with having his car confiscated. Nobody can say what they were supposed to have done wrong. Hugo Upton and Nigel Gambier in a Lagonda, hardly the fastest of cars, were “fined” 6,000 roubles (120-pounds), David Williams negotiated down a demand for a million roubles. The 1300cc Alfa of the Chiodis was tugged for speeding at 75 mph, they tried to explain that was more than the flat-out speed of the overloaded car but to no avail, they paid an on the spot fine of 2,000 roubles. A sour taste, much loss of goodwill, by over officious policemen eager to make a fast buck on the last day has not done relations much good. Andy Vann had his licence taken away – for supposedly overtaking a bus, an accusation he strongly denies. In the past 20 years, we only have had two really tricky borders where promises of help never materialised. Driving from Nepal into India on the last Peking to Paris in 1997 was an ultra-slow and highly bureaucratic affair, despite having paid $10,000 dollars to the national motor-sport federation, who demonstrated what they can organise by failing to turn up. A call to the BBC radio’s Mark Tulley suddenly changed attitudes and service, and the rally was back on schedule. And today. Events to Dakar, and other far flung places, have run without the kind of dramas we all experienced today. Tomorrow, we get to grips with some real rallying – we have arrived, today’s frustrations have to be put behind us.